It had been a number of years since we last visited the Vince Schute Wildlife Sanctuary so we decided to make a return trip. The Sanctuary got its start back in the 40’s as a logging camp. Bears kept breaking into the cook shack searching for food. For a number of years the loggers shot the bears. One day Vince Schute decided there might be a better way to solve the problem so he tried feeding them. It was so successful that what started out as one bear on the dole turned into close to a hundred. By the time Vince died friends were helping him feed the bears. Today it is a coordinated effort of many volunteers. A Raised observation platform was build to protect the bears from the tourists. Volunteers are on hand to explain bear behavior and talk about the bears who visit the sanctuary. Most of them have names and a history with the Sanctuary. 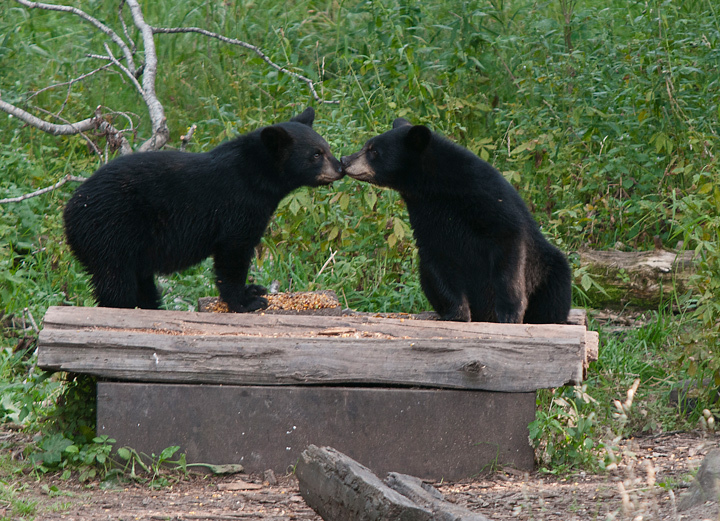 If you have never visited Vince Shute Wildlife Sanctuary it is something you should put on your bucket list. 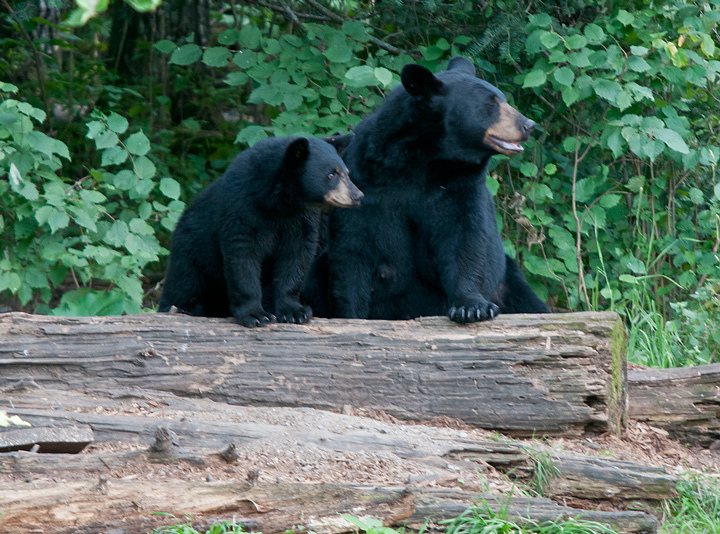 Our visits have been the last two weeks in August and we have been fortunate to see many bears. During this visit there were probably 50 bears in the area. It was a hot night so they were not as active as our last visit. Staff walk among the bears feeding them a combination of nuts, grains and honey. We were asked not to photograph the individuals doing the feeding. 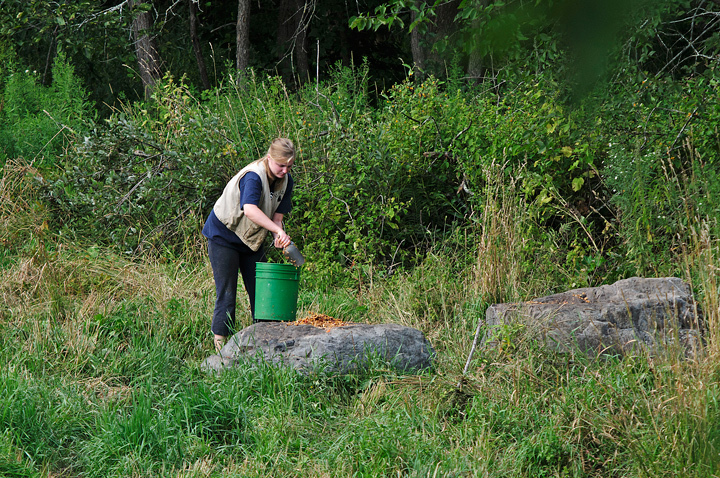 Feed is placed on rocks, stumps and in troughs made out of logs. 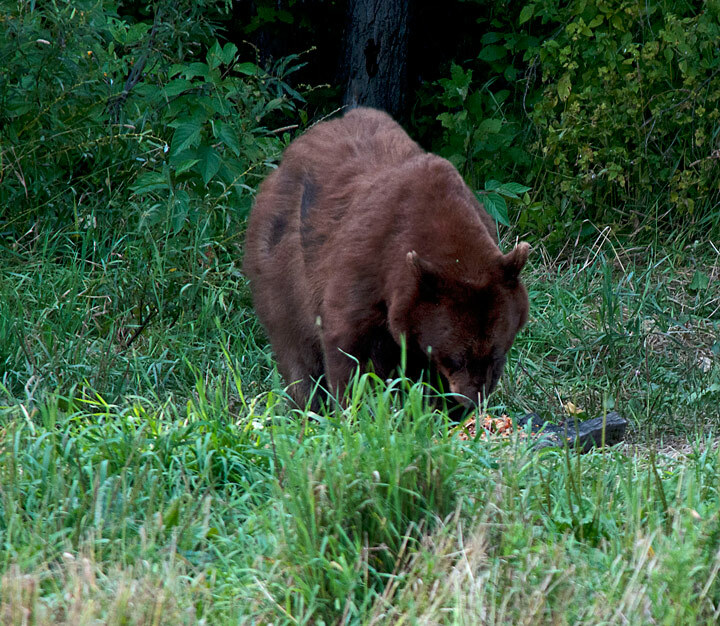 Notice that the bears can be a little protective of their food. 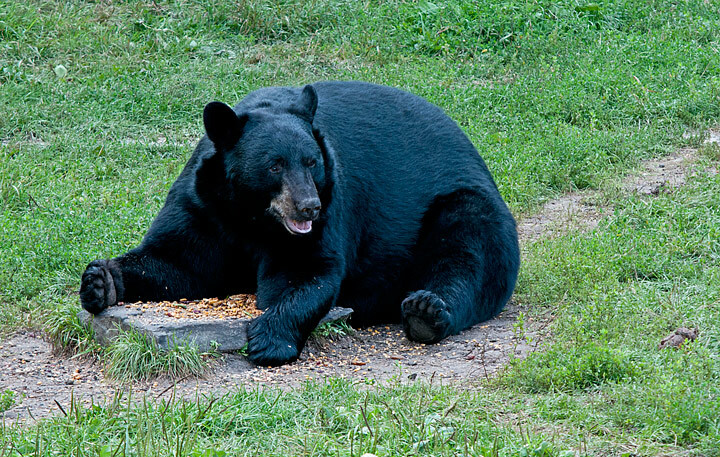 The last photo is of a bear that was full and decided to take a break. This yearling was having his problems. Every time he heard another bear huff he would race up the tree. 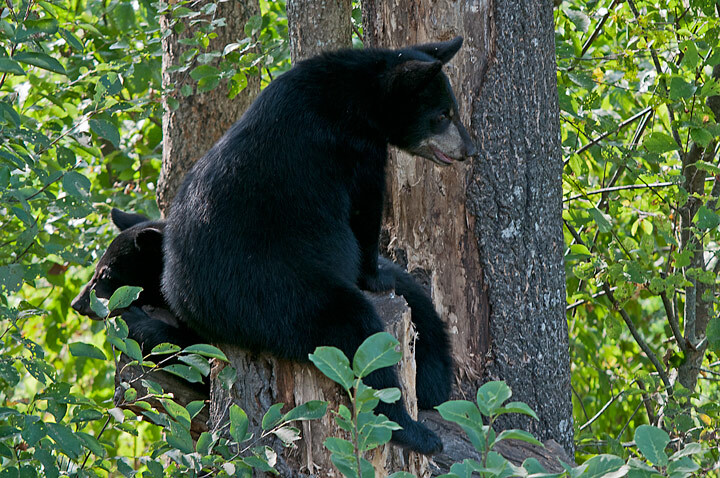 When the perceived danger left the area he would come down only to race up the tree when the next bear came along. It didn’t help that there was a feeding station at the bottom of the tree. The third picture shows why he didn’t want to come down the tree. Finally at end of the evening he was able to have a little dinner all to himself. On this visit we saw about 15 cubs most of them in trees. This was one of the smallest cubs we saw on our visit and was born this spring. He had climbed higher into the trees than the other cubs and was a crowd favorite. While we were watching he climbed way up into the tree. The last photo shows a small cub on the ground with its mother. This one was probably also born this spring. 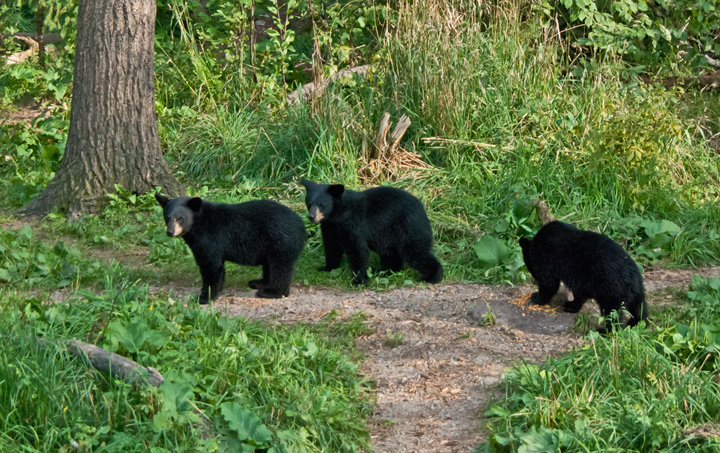 We were told that late in the evening the cubs would come down out of the trees. This bear was the only one tagged and collared. He was part of an ongoing research project being conducted by the Minnesota DNR. The ear tags were supposed to protect him from hunters. 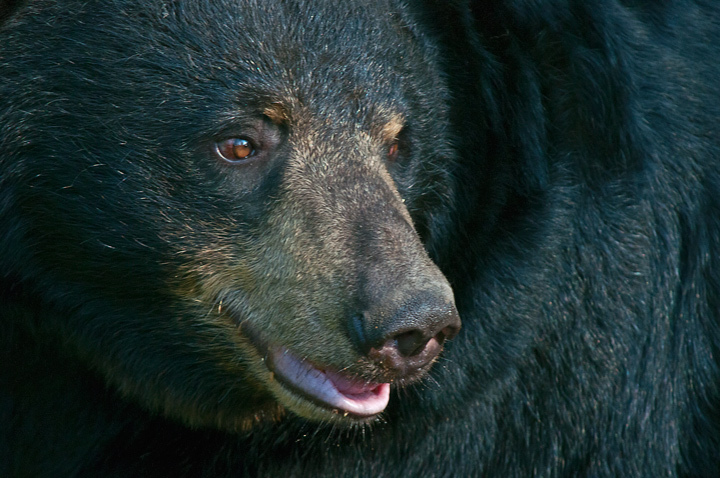 Hunting is allowed in the area but is discouraged on ethical grounds because the bears in the area are used to being around people.